Just as the Sarbannes-Oxley legislation in the USA is having a knock on effect for companies around the world, the global pharmaceutical industry will be affected by current guidelines and expected legislation from the US Food and Drug Administration (FDA). Earlier this year it issued guidelines aimed at hardening the pharmaceutical supply chain to crack down on the substantial trade in counterfeit drugs. This is seen as being a precursor to formal legislation on the adoption of RFID by the industry. In Europe, problems with counterfeiting are supplemented by the substantial movement and repackaging of branded drugs between countries within the EU. Some UK pharmaceutical firms are now more seriously exploring the benefits of RFID, but many believe that an industry-wide approach must be adopted--encompassing drug companies, distributors, pharmacies and healthcare providers at all levels--for adoption to succeed. A recent BT showcase on this topic highlighted what could be possible. Branded drugs could be identified down to the packet level--not just along the length of the supply chain--but also in hospitals, GPs' surgeries and pharmacies. Geoffrey Barraclough, of BT Auto-ID Services, explains: "If you can automate processes then you are on to a winner. RFID is always on, the scanners are always reading, though we use filtering so that they are not passing on information constantly if there is no state change." "Automated data capture can save some labour and give better accuracy. If you put more check points in the supply chain you can get actual stock levels rather than the book stock levels. This won't stop leaky distribution, but at least it will tell you where it is leaking from." 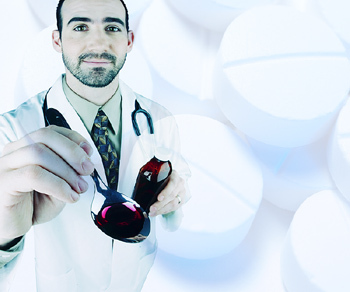 RFID is already being used to verify drugs at the point of sale. In the UK, six pharmaceutical companies and 50 dispensing outlets are currently testing a new method of detecting fraudulent and counterfeit medicines in a pilot being run by Aegate Ltd--a spin out from PA Consulting Group in partnership with BT. The Authentication at the point of Dispensing pilot is the first of its kind to provide pharmacists and dispensing doctors with information about the authenticity of the products at the point of dispensing. It bypasses the supply chain and focuses on the authenticity of products only at the point of manufacture and at the point where they are given to patients. Ross Hall, CEO, BT Auto-ID Services, explains: "The European pharmaceutical supply chain is very complex, with drugs sometimes being traded multiple times before they reach the patient. RFID and other scanning technologies have been the subject of much discussion recently, and we believe that this pilot will demonstrate vital business benefits accruing as a result of the intelligent deployment of such technologies. It is an important step in pioneering a new, workflow-based approach towards the supply chain." Aegate is managing the pilot, providing pharmacy equipment and training as well as the database application. BT is providing the networked IT services (server hosting, a freephone helpline number and help desk support) as well as broadband connectivity to the pharmacies. Results are expected early in 2005. However, some drug firms are not convinced that the benefits of RFID can be realised in Europe without revision of legislation on the trade in pharmaceuticals. Commodity brokering of drugs has created a parallel market, and drugs may be channelled between several European markets, and repeatedly re-packaged and labelled before reaching a retailer. Julian Mount, Pfizer's European Director of Trade, says: "Coding can only help patient safety if it is part of a joined up solution. It is no good if only the manufacturers are self-verifying or if this silly re-packaging law allows the coding to be removed." Geoffrey Barraclough adds: "There is an element of cost--the cost of the physical network of scanners, the network itself, running multiple databases and the costs of the tags. Some say that the government or NHS should pay for this, and others the pharmaceutical industry. The pull has got to come from the customer--in this case the NHS." Speech technology firm Vocollect has already seen success in Australian pharmaceutical firms with its voice-enabled supply chain solution, Talkman. Apart from improving efficiency and accuracy, the firm's Business Development Manager Tim Wheeler, says the technology also complements RFID advancements in the sector. Talkman is a "hands-free, eyes-free" voice-directed software system that allows warehouse staff to send and receive information via wearable devices. Voice commands guide operators around distribution centres so they can pick and pack orders, and send information to back-office systems in real-time. A help feature allows workers to seek further advice at all times, and the solution can interface with existing warehouse management systems. Tim Wheeler says that the solution gets much higher accuracy levels from warehouse operatives than if they are working with paper instructions and barcodes. He thinks that while RFID may replace barcoding, it complements voice-based systems such as Talkman because they both allow operatives to stay hands-free, but voice is the most productive way for humans to interface with computers. Like many other technologies that have become commercially successful over the years, RFID proved its capability in military environments. The world's largest RFID network was created by the US Department of Defense in partnership with integrator Unisys following the first Gulf War. The network provides "inside the box" visibility and nodal tracking of ordanace, medical supplies and other cargo. It combines RFID, optical scanning and satellite technologies and is currently being used during operations in Afghanistan and Iraq. In total, more than 50 countries are covered, with 750 nodes including airports sea terminals and rail terminals. Currently it tracks and secures approximately 350,000 conveyances and 25,000 containers every day.